Ranga Handmade Pens is a brainchild of M.S. Pandurangan who himself is a master pen turner and all pens and pencils are made by him only. His son M.P. Kandan is doing great deeds by taking care of the business part of Ranga Handmade Pens. I must add that both he and his father are very humble and polite. I have organized few group buys on Fountain Pen Network for Ranga Pens and every time the dealing with him have been very professional. He has never lapsed on the dates as far as his commitment and deliverables are concerned. But yes that’s what my experience has been till date and I hope he continues to do the same. Ranga Pens make use of ebonite and acrylic for pens and in fact they are the first and one amongst two pen makers in India to offer Premium Ebonite. They have a dedicated eBay store where they sell not just Ranga Pens but also pens from other manufacturers from India like Wality, Oliver, Fellowship etc. which are all machine turned. The pens from Ranga are also stocked by Teri of Peyton Street Pens in the USA with also some exclusive models. And I have already reviewed one of the models which is Model 4C but this review is about one of the unique model in their line-up which is Bamboo. The pen design resembles the natural bamboo with forged joints acting as nodes and parts between the two nodes acting as inter-nodes. The pen in a review is the clip-less demonstrator in a brushed version with polished finials. All in all, there are 5 nodes with smaller internodes at cap and to me, that provides it natural character. The finials, both top, and bottom, are polished and are in the conical dome shape. Once thing to be noticed is that the cap finial is smaller in length as compared to the barrel finial and the reason for that is to provide balance to the pen when writing so that it does not become top heavy. The internodes in the cap are smaller than what is on the barrels in length. The cap also has breather hole and this version is clip-less so it looks like one bamboo rod albeit in a different material. The cap closes to form a node and it actually flushes with the barrel as can be seen from the picture above. There is a minute drop between section and barrel as the cap flares at the bottom where it meets the barrel. The grip section is polished and not in matte finish. There is no branding anywhere on this pen. Below are the images of the pen showing pen capped and uncapped. It is superbly crafted pen with a very unique bamboo style pen like no other. And I believe the pen is worth the price it commands. The pen is also available in different ebonite and acrylic materials which must be around 30 plus in nos. So one has a lot of options to get the pen in his particular color and finish liking. Kudos to Ranga for the superb design. The pen has a matte finish which is executed very well and transition from a matte finish to polished finials is sublime though they are not perfect but it’s close. Earlier I thought that the finials could be made symmetrical in length but part of the reason to do that was to keep the pen balanced while writing without increasing the length of the cap. But then I thought otherwise, this asymmetry is what gives it natural character. The cap opens in 4 turns and threads are very well crafted and are not at all sharp. The grip section as mentioned is also very well polished. Also, I must add that the polished end of the finials is highly polished and very neat without any lathe marks visible. I applied silicon grease on the nib unit which you can see from the image above as I eyedropper-ed the pen. The finish, the grooves, the material quality are all top notch. However, one thing I want to mention is the material thickness decreases at the cap lip and must be handled very well as there is no band to protect any kind of crack. This is a handmade pen completely and is a “WOW” product at this price point. The cap posts but only just and that too not very securely. I think it is not required as it makes the absurdly large and uncomfortable also the pen itself is very long at 135 mm when uncapped. The pen is very well balanced with just a little more weight in the front end of a nib unit. One thing of worthy mention here is that the grip section long and comfortable and makes this pen as a gem of a writer for long writing sessions. The pen comes with variety of #6 size nib options like JoWo EF, F, M, B, 1.1, & 1.5 and Schmidt F, M, & B for CC mechanism which is a threaded screw in one and also can be used as an eyedropper too and other nib options are Ambitious and Bock (Conklin imprinted) but these are only for eye dropper version of pens. The nib that I took was the dual tone Bold point JoWo nib which is a screw in nib unit with plastic high finned nib and it performed flawlessly out of the box with welcome feedback. It is a juicy firm nib and writes wet. I sometimes wonder why I need gold nib when this nib performs so well. The ink is filled via converter and cartridge can be also used. But real fun lies in using this pen as an eyedropper and seeing the ink sloshing inside. Ink capacity around 4ml if used as an eyedropper. The converter that comes with the pen is Schmidt K5 and has a capacity of 0.6 ml. One thing to be noted is that before you use it as an eyedropper do apply silicone grease on threads of the barrel and also on nib unit threads. I pen is available in a group buy at FPN for US$85 which is a steal considering it is handmade pen and it is a unique design. The pen is more of an artifact from India and is recommended to users who want something more from a pen. Oh, I like this. How can I order a clear one like this? I just love this pen. Can you guide me on where to get it please. My mail I’d is ashwinbharani@gmail.com. Hi I am interested to buy one of these. Can you help please? hi great review im a fp noob, this helps alot. where can i get ranga demonstrator in india? online or otherwise. I think I recognize the locale where the rainy photos were taken. MacArthur Park, isn’t it ? Very nice review to see. Hey.. This is some place in Jaipur.. I also wonder, is this fp designed to drop the ink directly into the barrel? What would be the ink content/volume? Thank you again.. It takes lot of time.. To get shots correct..
That’s a big volume. I wonder how the pen behaves at changing climate and air-pressure. Any experience? It’s stunning ! My wish is that someone mass produces these kinds of pens, that appear to be handmade but aren’t . I sadly don’t take (good) care of my pens, I modify them, throw them around; the list is endless ! 😦 whenever I buy a handmade pen, despite my best efforts, (I) without an exception end up treating it like every other pen ( *cough* *cough* those cheap ball pens *cough*). That would be tricky… mass produced products tend to be identical…I guess, as long as you don’t buy two and let them lay next to each other, no problemo….and then, only an ingeneer would close enough to notice that they are identical….and it would need to be a curious one, not many of them. OK then, let’s do it! This pen is a masterpiece. I thought that the ebonite version was good but the demonstrator version is great. Thanks for a wonderful review Vaibhav. You are setting higher standards with each review. Thank you srinivas.. I am really humbled.. Thank you for a through review. Appreciated. Are you sure a “IPG” nib is a JoWo? Everyone should own at least one “Ranga”. it comes with different stamping and engravings and sometimes even no engraving…. wonderful review as always, and beautiful pictures, however the eyes want to see a clear version of the bamboo in acrylic. I saw this pen in Ranga’s ebay page and emailed Mr. Kandan immediately. So, I was a bit sad to see the FPN group-buy a week later :-). The pen arrived soon and it was a beauty. As I wanted to eye-dropper convert it, I took it with an Ambitious nib. But, later put a Jowo medium nib with the original ebonite feed. I had to heat set it to get the flow right. But, now it writes well. It is indeed a beauty and your photos capture it very well. I liked the first photo very much. Enjoy the pen in good health. 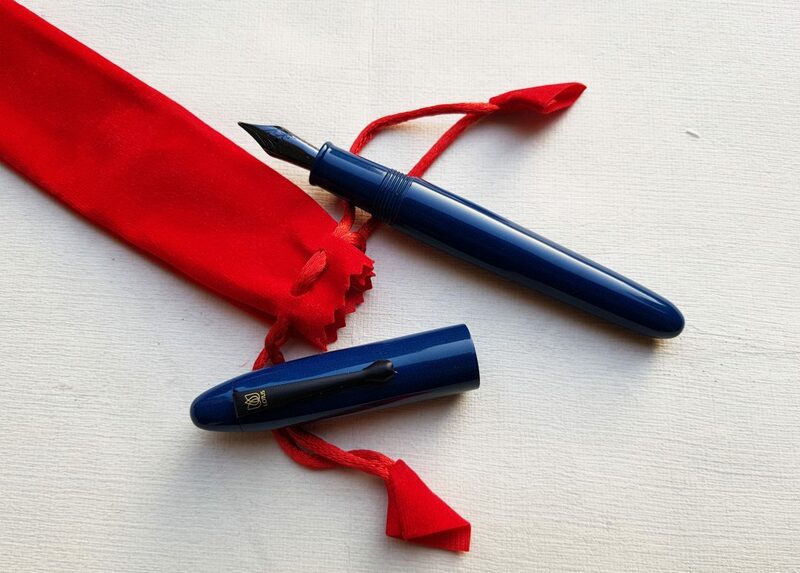 thank you dinuraj.. Where did u get the spare jowo nib.. How the pen has been treating you.. Will love to see your pics of pen..
Got spare Jowo nibs from asa pens. The feed and nib combo is yet perfect. It has startup issues some times. Might need to heat set it again. Need photograph it.. will post the pics soon. Hi Dinuraj… you wrote about heat-setting. I am not familiar with this technique. Would you explain, please? Great photos and excellent review. Thank you.